In Wedding of the Year: Abandoned at the Altar, Laura Lee Guhrke introduced us to Aidan Carr, the Duke of Trathen, and Lady Julia Yardley, the cousin of his former bride to be, Beatrix Danbury, now the Duchess of Sunderland. Both unlucky in love and marriage in totally different ways, we sense there may be more to their relationship than meets the eye, but we are not privy to whatever secrets these two hold. It all becomes clear in Scandal of the Year. Aidan Carr, Duke of Trathen, straight-laced and honorable as dukes come, has two broken engagements behind him, the first to Beatrix and the second to a Scottish lass, who runs the other way when Aidan is discovered with Lady Julia Yardley in a compromising position. Lady Julia, married off to Baron Yardley after a disastrous teen-aged love affair, is desperate to escape her husband, and uses Aidan to that end. The story begins in divorce court (this is 1903 after all) where Aidan is named as the other man after Julia's husband discovers them in bed. Yardley is granted his divorce from his adulterous wife and Julia is finally free. Aidan cannot forget her even if the details of their afternoon and night together are a bit sketchy. What follows is the slow realization that despite his wish to find an amiable wife and sire a nursery full of children, Aidan cannot get Julia out of his mind. And despite her disastrous turn at marriage, and the damage caused by her abusive and lecherous ex-husband, Julia can't seem to forget Aidan and their past. 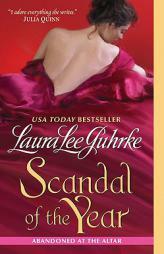 Laura Lee Guhrke tells the story with a series of short flash-back chapters that fill in the gaps in their relationship. We come to understand the tension between Aidan and Julia that was first obvious in the first book of the series. And we see how the relationship between these two comes full circle, despite society's mores on the subject of divorce. So far, the Abandoned at the Altar series shows a well thought out and best of all, a tightly interrelated story line that ties up loose ends for characters we've come to care about and whose supporting roles in the previous book leaves more than a few questions unanswered. It's lovely when those characters get their own happy endings. I'm guessing the next story will be about Julia's cousin, Paul whose wealthy American wife has left him for her native shores. I like Paul as a character and I am really hoping he gets his happy ending as well. On the whole, while I enjoyed Scandal of the Year, I more thoroughly enjoyed Wedding of the Season. Read them both, however. Aidan Thomas Carr deserves to finally make it all the way to the altar. When Tess Monaghan is ordered bed rest for the duration of her pregnancy, the private investigator spends her time playing on the internet, her iPhone, and watching the dog walkers in the nearby park. She is particularly interested in a girl in a green raincoat, constantly on her cell phone, walking an Italian greyhound on a matching green leash. Then one day, Tess notices the dog running through the park, its matching owner no where around. The detective in Tess comes alive as she worries for the fate of the girl in the green raincoat. What seems to be a simple missing persons case turns into a complicated mess of dead wives, accidental deaths, and too many holes in the story. Tess, with the help of her team of Mrs. Blossom and Whitney, track down the husband of the girl, and immediately think he has murdered his poor wife, as he had his previous ones. As they dig for the truth, Tess comes to terms with her impending motherhood, whether or not she will receive a proposal from her boyfriend, and what her life will be like after her daughter is born. When Tess digs too deep, and the missing girl appears at her door, the truth comes out, but in the way you would expect. Laura Lippman is a new author for me, and I found her straightforward, flawless writing to be refreshing in a genre that is sometimes plagued by too dramatic prose. Since I love a good mystery, this novel proved to be a quick read that kept me engaged as Lippman revealed her plot a little at a time. A nice read for a cold winter's day. In this second installment of Ms. Bernard's Jaded series, we are re-introduced to Ashe Blackwell, another former East India company man with a secret. Held captive in India for a year with the other members of this "club," he escapes with them back to England. They take with them horrible memories of torture and death, as well as a treasure of priceless jewels, found in their dungeon cell. While danger follows some of them back, they all choose to ignore it. Ashe, scarred by a love affair in India gone horribly wrong, tries to forget by living a life of debauchery. As he takes this to a new level, his grandfather becomes concerned. As heir to the Blackwell fortune, Ashe needs to toe the line and when he is summoned back to the ancestral home, he learns he must straighten up and fly right for an entire Season, or he will be disinherited. In order to accomplish the goal of keeping tabs on his grandson, Gordon Blackwell enlists the aide of his best friend's daughter, American Caroline Townsend, for the task. Caroline is looking for an escape from her strict aunt and impoverished upbringing, and sees the task and the £20.000 Gordon dangles before her as the perfect opportunity to bring her dream of founding a woman's college to fruition. In a twist for a historical romance, she becomes HIS chaperone. When Ashe learns that this uncouth American spinster, with her drab wardrobe and unbridled tongue, is to be his watch dog, thoughts of rebellion take root. For outward appearances, Caroline is presented as his ward, and he as her guardian. It's an interesting plot twist that causes a bit of confusion at first, as I had to remind myself who was watching who. And of course, Ashe starts to see something in Caroline that was not apparent at first. She is intelligent, can hold her own in a conversation, has a quick wit and above all, shows Ashe a hidden glimpse of herself when she sleepwalks. Yes, that is correct. Caroline sleepwalks, and when she does, she has a tendency to visit Ashe in his room while leaving her inhibitions back in hers. We get to watch Ashe as he fights his demons, but finally succumbs to love. It would be nice, however, if he told Caroline how he really felt. Both of them dance around the truth for a good part of the story, and it's only a threat from an outsider that finally forces them to realize just how much they stand to lose by keeping themselves invincible to hurt. Ms. Bernard writes her Jaded series with both strong female and male protagonists. There's also an abundance of, shall we say, interesting encounters of the bedroom variety. This formula makes for a more than satisfying resolution when the last page is turned. I'm looking forward to the next in the Jaded series, and I have a feeling that story will belong to Darius Thorne, Ashe's best friend and fellow member of the club to which none of its members really want to belong. Bookishly Attentive is hosting its first ever Romance Reading Challenge! Click for more information! If you wish to participate in the challenge, please reply to this post with your name and a link to the post on your blog indicating which challenge level you have chosen. If you don't have a blog, please indicate this information in your comment. Bloggers: please feel free to post our challenge graphic on your blog! Good luck!